Elsa Taylor lives and paints in an old Smithy at her small cottage in the Cotswolds. Her inspiration derives from the surrounding countryside, from her travels to the Umbrian hills and from the dramatic beauty of the far north of Scotland and the coast of Cornwall – it is these very different landscapes that form the bedrock of her work. 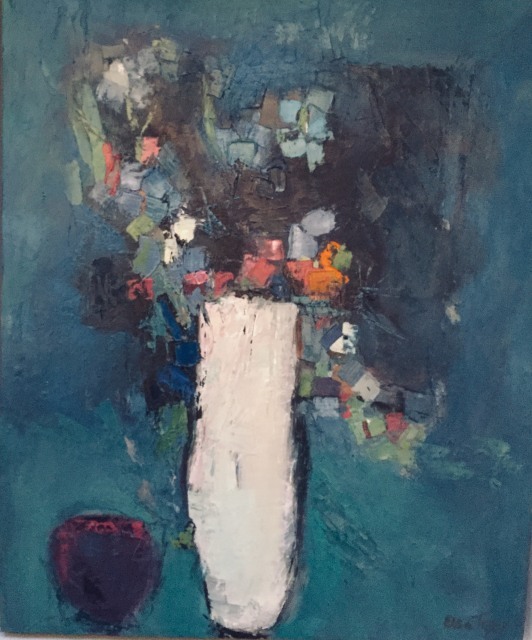 The construction and composition of the landscape and also of flowers has sparked her interest in abstraction and a fascination with their colours, textures and patterns. Her paintings are of the heart and mind, an emotional response to the landscape. She has studied with Robin Child at the Lydgate Art Research Centre and his teaching continues to inform and inspire her work. His lectures and the subsequent intensive study of past masters has brought about an awareness and appreciation of art that changed the course of her painting. "Many artists have influenced my work thanks to Robin and his extraordinary insight. From Cezanne to Giorgio Morandi, Nicholas de Stael and Richard Diebenkorn..I look constantly and try to learn from the lessons that they reveal". Elsa exhibits widely across the country.